PDR name Top Rising Design Giant by Interior Design Magazine. PDR Selected as a Finalist for the Society of the British Design Award! PDR is proud to be listed in Interior Design’s 2016 Top 100 Giants list. PDR’s Product Runway design team stole the spotlight at Friday night’s 8th Annual Product Runway fashion show with their couture adaptation of Pablo Picasso’s painting, Weeping Woman. The garment, composed of architectural finish materials from Horizon Italian Tile and Milliken pays tribute to the original cubist artwork with a somber color palette and flattened, angular shapes that reflect Picasso’s representation of the Weeping Woman’s tears. PDR’s design was a crowd favorite and received the award for 2nd Place out of 19 entries. This year’s Product Runway theme, Avant Art, required each of the competing teams, comprised of interior design and architecture professionals and interior design students, to design and construct a garment representing an assigned art movement and correlating artist. PDR’s team had the privilege of creating a design based on Cubism and the work of Picasso. Product Runway is an annual charitable event hosted by the Texas Oklahoma Chapter of the International Interior Design Association (IIDA) benefitting the Houston Furniture Bank, a local non-profit that makes houses into homes by providing furniture for families in need. In addition to designing and constructing their award-winning entry to the fashion show, PDR’s design team raised over $900 in support of the event. Each year, PDR participates in Product Runway for the opportunity to cultivate our Inside Out mindset by leveraging our design talent to support and improve our Houston community. PDR’s submission to World Interior News (WIN) Awards 2016 in the Workspace Interiors Greater Than 10,000SQM category, made the long list. Rapid growth spurred our client to consider an office expansion while newly vacated space higher up within the same building provided the opportunity for contiguous floors. The challenge was to take their workplace to the next level in terms of efficiency, collaboration and aesthetics. The nearly 200k sqft buildout, completed in January 2015, needed to build on their existing culture, move the workplace toward a more open and connected arrangement, and support a very agile workforce. Addressing the need for a more open, connected arrangement, we developed a “Collaborative Core” on every floor incorporating a break room, phone rooms, two huddle rooms, a copy-print center, and a new open stair connecting all eight floors. The “Collaborative Core” brings together a variety of functions that draw employees together, fostering impromptu conversations and community. This space is the heart of the office, and reflects the corporate culture. Offices are oriented toward workstations, allowing everyone access to natural daylight. Neighborhoods, created through a rhythm of open and closed work areas, connect teams. Automated roller shades maximize the daylight, opening up the workplace. Existing building geometry and column grids created the opportunity for all corners to become meeting spaces, producing consistency on each floor. The color palette and materials were selected to create a timeless, minimal aesthetic. With limited flexibility in the ceiling height, finishes and materials move from floor to wall and onto the ceiling, pushing and pulling in shallow planes to form the illusion of expanded spaces. 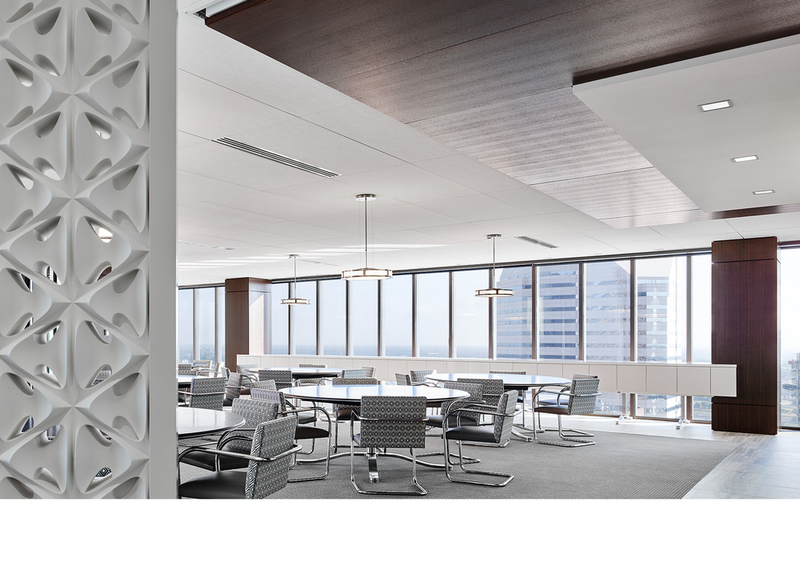 Stainless steel, matte back-painted glass, and dark gray-stained walnut paneling on the walls and ceiling in the elevator lobbies set the tone of the space. This tone, joined with the efficiency and connectivity of the space, creates a dynamic workplace that reflects the client’s culture and goals.